On November 3rd I introduced you to the scrumptious artwork of Janet Hill. You will remember the beautiful colours and charming subject matter, often featuring readers with their books. I jotted a quick note to Janet and let her know I was a fan and, as such, had featured her here on Bedside Table Books. 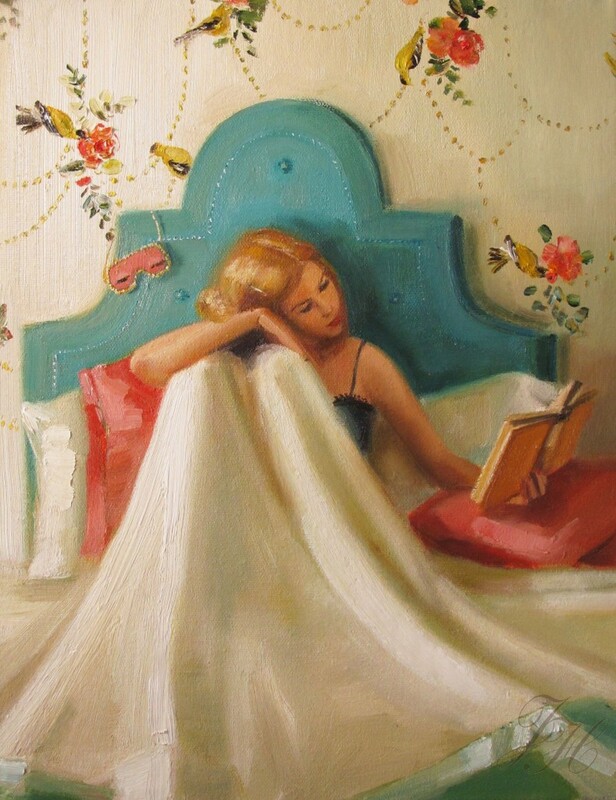 She kindly replied, professing her own love of books, and mused that because they were all around her they seemed to find their way into her paintings. Tonight, as I was about to climb into bed with my book (looking much frumpier and more flannel-ized than the lovely lady above! ), I thought I’d drop in on Bedside Table Books and see what was happening. And something WAS happening. A flurry of visitors was making its way over from Janet Hill’s blog site. It seems (and you’ll have to click here and read the story for yourself) that Janet was intrigued by John Gannam who was chatted about along with her here on the 3rd of November. She was so taken by his work in fact, that she was inspired to create the absolutely gorgeous painting above. She writes that she painted it with Gannam and the impish Holly Golightly in mind. The work is called “Goldfinch” and you will want to spend some time admiring it on Janet’s etsy site. Sadly, it has already sold. I am sure it will make its new owner very happy though! And so I thought I’d share this tale with you – I love a little story of sharing ideas and inspiration … and always with a book in hand.